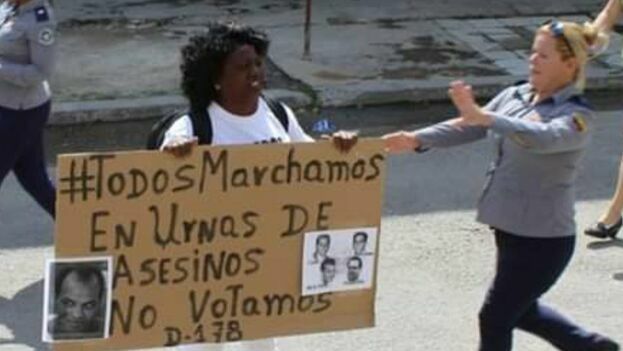 14ymedio, Havana, March 5, 2019 — The detentions for political reasons in Cuba increased to 310 in February compared to 144 in January, the Cuban Commission of Human Rights and National Reconciliation (CCDHRN) denounced in its monthly report published this Wednesday. The number is substantially below the figure reported by the Cuban Observatory of Human Rights (OCDH), based in Madrid, last Sunday, which placed arrests at 405. According to the CCDHRN, before the referendum held on February 24, a “large mobilization” of the police and para-police forces took place, capable of exercising “preventive repression and intimidation” on citizens classified as disaffected or non-sympathetic to the Government. Likewise, it cites as two new cases of political prisoners those of Yasser Rivero Boni and Salvador Reyes Peña, arrested in Havana on 10 and 16 February respectively and interned in high security prisons. On its list of political prisoners updated last December, the Commission cited between 130 and 140 people detained in one of the 150 prisons and internment camps currently operating on the island. In its new monthly report it also denounces “48 acts of harassment (basically threats) and 12 physical attacks,” repressive actions carried out or orchestrated by the political police. What happened “demonstrates that, in face of rebellious expressions and discontent over the economic situation, the Government of Cuba opts to intensify repression and not for reforms,” stresses the text published by the organization headquartered in Madrid. “In addition to the arrests, the repressive action included raids on homes, confiscations of work materials, fines, house arrests, and violent episodes against human rights activists and independent electoral observers,” specified the OCDH. The provinces with the greatest incidence of these repressive acts were Santiago de Cuba, Havana, and Matanzas, while among the most repressed independent organizations were the Patriotic Union of Cuba, the Ladies in White, the United Antitotalitarian Forum, and the Cuban Association of Electoral Observers, among others. “We blame the Government of Miguel Díaz-Canel for the growing repression against independent activists. Almost a year after his appointment to the leadership of the country, the siege against civil society remains,” sustains the Observatory. Something that “reasserts the repressive line of the Government and shows Havana’s worry about the real results of the constitutional referendum,” denounced Alejandro González Raga, executive director of OCDH.